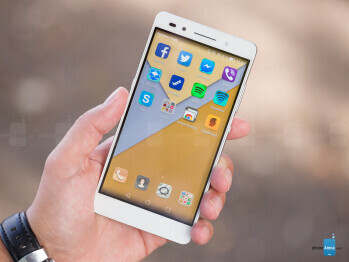 “What _phone_ is that?” - we’ve been asked this numerous times since we started using the honor 7 as a daily driver several weeks ago. Clearly, the bold brand name embossed on the back of our handset didn’t ring a bell to anyone but our most tech-savvy buddies. 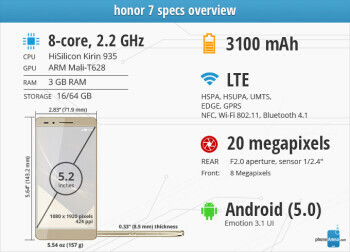 Surprising this was not, as honor is one of the newer players in the smartphone arena. In fact, it has been less than a year since honor became an entity of its own, ran separately from its parent company - Huawei. 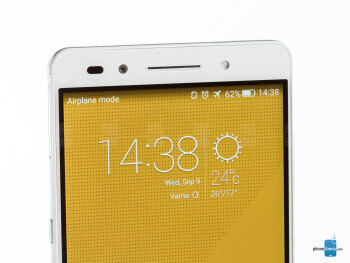 The honor 7 is the young brand’s current flagship smartphone. Several months after launching in China, where it was met with overwhelming demand, the Android 5.0-based handset was released in Europe as well, priced at 350 euro (roughly $400). In exchange you get a 5.2-inch display, an octa-core Kirin 935 SoC, a 20MP camera, and a 3100mAh battery, among other goodies, all encased in a metal-made body. Sounds like a good deal, doesn’t it? Well, let’s find out if that’s the case. A typical modern-day smartphone with a metal-made body and adequate size for a 5.2-incher. The Smart button and fingerprint scanner are welcome bonuses. 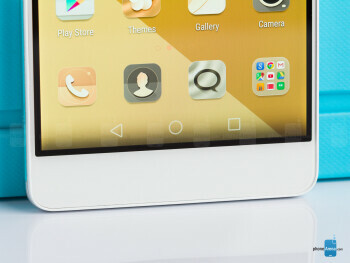 At a glance, the honor 7 looks like a typical modern-day smartphone. It is a rectangular, mostly flat device with slight curves at its four corners. The moment you pick the _phone_ up, however, your fingers will detect the cold feel of its non-removable metal back plate and sides. Yes, the honor 7 has a mostly metallic build, which adds a welcome dose of premium feel to an upper mid-range handset. The metal surface is immune to fingerprints, and it is showing no signs of wear after several weeks of use (and maybe a few accidental bumps). Handling the honor 7 isn’t much of a trouble given its size and weight, and we’ve never had troubles fitting it in the pockets of a regular pair of jeans. At 5.64 by 2.83 inches (143.2 by 71.9 mm), it is of typical proportions, if not slightly smaller, for a smartphone rocking a 5.2-inch screen. 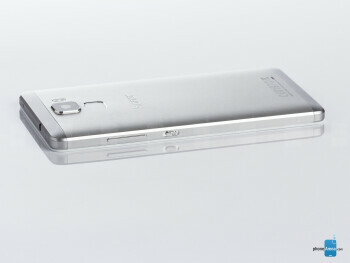 It is neither too thin, neither too thick, measuring 0.33 inches (8.5 mm) if we don’t count its protruding camera. The mostly flat back of the honor 7 is slightly sloped near the ends, which, together with the beveled edges, contributes to a comfy grip. And to facilitate single-handed usage, there’s a single-handed mode that scales down the UI, making even its furthest corners reachable, although we can’t remember a time when we really, really needed to use it. While the honor 7 has a mostly metallic build, there are two plastic elements on the phone’s top and bottom - behind them reside its antennas. These elements spoil the looks of the handset a bit as they reflect light differently and are not perfectly aligned with the metal plate at the seams. The tray for the SIM and microSD cards does not seem to fit ideally either. Bear in mind that these slight imperfections could be limited to our review unit only. Looking at the sides, a metal-made power key and volume rocker reside on the phone’s right side. They are raised well and respond with sufficient tactile feedback. On the opposite side is found the Smart key, which is a programmable button, and up to three functions can be assigned to it. We find it useful, as it lets us easily turn on the flashlight, initiate a Google search, or launch our favorite music app without even looking, for example. However, since the Smart key is placed oppositely of the power key, pressing the latter might result in accidentally pressing the former as well. It happened to us on several occasions, but eventually, our fingers got used to the buttons’ arrangement. On the back of the honor 7, below the camera, is positioned a fingerprint scanner that reads your fingerprints when touched, not swiped. That's a good thing as scanners using the latter method aren't as reliable, as our experience goes to show. The honor 7's scanner isn't perfectly accurate either, but it does work at least 4 out of 5 times. To improve its reliability, you may enroll the same finger twice, touching different areas of its tip when registering it. 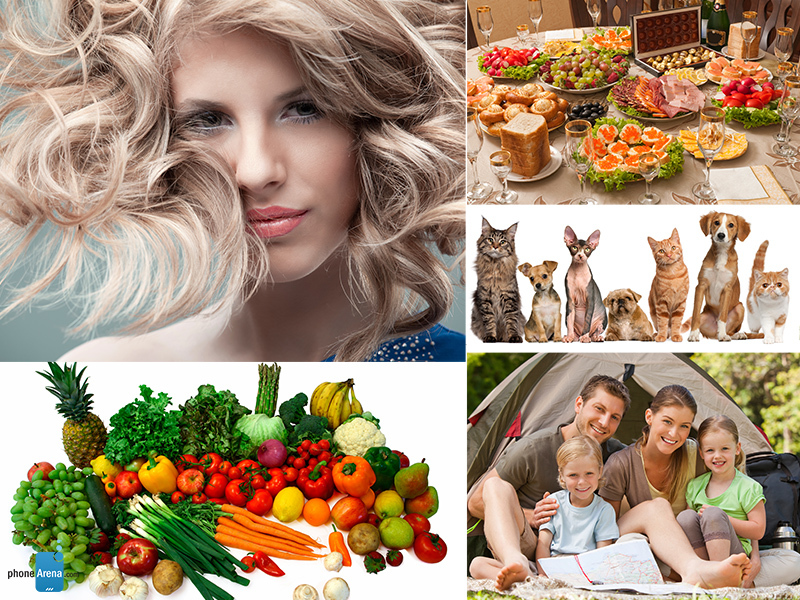 Large, with high resolution for great details. Color accuracy, however, leaves something to be desired. 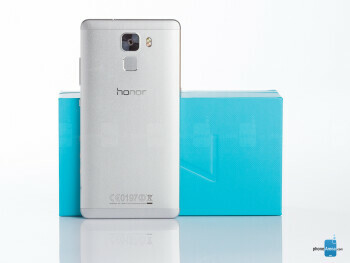 The honor 7 sports a 5.2-inch IPS LCD display, made by Japan Display, with a resolution of 1080 by 1920 pixels. This translates to a pixel density of 424 ppi, producing clear, crisp, pixelation-free visuals. The resolution isn’t ground-breaking, of course, as we already have QHD-resolution displays of such diagonal size, but to tell you the truth, the pixel count of the honor 7’s screen is perfectly sufficient for any need. On the downside, the screen of the honor 7 is noticeably cold-looking - we measured a color temperature of over 7600K, which explains the display’s blueish tint. We must mention that the second honor 7 unit that we tested had an even more inaccurate display, clocking in at around 9000K. Not all users will be bothered by this flaw, of course, but those who are may adjust the display’s color temperature from the Settings menu. Still, we do wish that colors were more accurate out of the box. On a related note, our color measurements indicate that the screen produces slightly overblown shades of red and green. The honor 7 is mostly usable under sunlight. We measured a peak brightness value of 436 nits, which is an acceptable figure. It is far from ideal, however, as bright sunlight reflected at the user’s eyes renders the screen very difficult to use. The minimum brightness value of 9 nits is an average figure - using the honor 7 in the dark is rather comfortable, although it would have been better if the screen could get even dimmer. Before we move on, we must mention that a screen protector is pre-applied on the honor 7. It does not spoil the viewing experience in any way, and leaving it on would be a good idea as it will protect the display against damage. 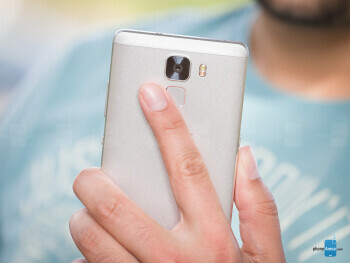 However, finger traces stick to it more easily compared to the bare glass surface of the touchscreen. “What phone is that?” - we’ve been asked this numerous times since we started using the honor 7 as a daily driver several weeks ago. Clearly, the bold brand name embossed on the back of our handset didn’t ring a bell to anyone but our most tech-savvy buddies. 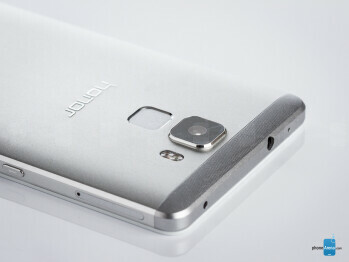 Surprising this was not, as honor is one of the newer players in the smartphone arena. In fact, it has been less than a year since honor became an entity of its own, ran separately from its parent company - Huawei. 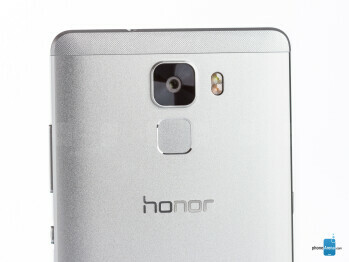 At a glance, the honor 7 looks like a typical modern-day smartphone. It is a rectangular, mostly flat device with slight curves at its four corners. The moment you pick the phone up, however, your fingers will detect the cold feel of its non-removable metal back plate and sides. Yes, the honor 7 has a mostly metallic build, which adds a welcome dose of premium feel to an upper mid-range handset. The metal surface is immune to fingerprints, and it is showing no signs of wear after several weeks of use (and maybe a few accidental bumps). EMUI adds meaningful improvements to the user experience, but the software is too aggressive with not allowing background apps to do their thing. Android 5.0.2 Lollipop runs on the honor 7, but it is far from its stock form. On top of it we find Huawei's own EMUI 3.1, which changes the UI visually and adds a broad array of new features. However, we're having seriously mixed feelings about the software experience as a whole, but let’s first go over the good stuff. To some extent, the UI has been inspired by Apple's iOS. 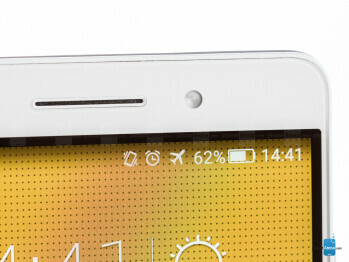 Long-time Android users will instantly notice that an app drawer is missing on the honor 7. Instead, all apps appear on your home screen and can be organized in folders. That's a change we’re okay with as it simplifies the user experience. Another iOS-like feature we came across was the quick search bar, accessed with a swipe down on any home screen. Besides letting you search the web, it displays frequently used apps and lets you search for a specific app you have installed on your honor 7. What's also been substantially modified is the pull-down notification panel. It is split in two, with screens dedicated to your notifications and toggle switches. That's a change we don't mind either as it dedicates plenty of space for both your notifications and your toggles. We also find support for themes on the honor 7 - six of them come pre-loaded. Applying one changes the icons, the wallpaper, the unlock animation, as well as other subtle visual elements here and there. In addition, you get a nice variety of pretty static and dynamic wallpapers to choose from. Downloading new themes, however, is a challenge - it is a manual process requiring you to place theme packs in a specific folder. Having a proper theme downloader app of some kind would have been nice. The one-handed mode we mentioned earlier is activated by swiping from left to right or right to left over the on-screen navigation buttons. It shrinks down the UI and places it in the corner - we can reach the furthest corner of the interface without an issue. Clearly, the EMUI 3.1 interface running the honor 7 adds a lot of changes, most of which are meaningful and improve the user experience. However, there are things about the software that we don’t quite like. One of them is the way the honor 7 deals with background app activity. Simply put, we’d say that the phone is too aggressive. To give a specific example, we found out that Dropbox wasn’t uploading images automatically and Viber wasn’t displaying any incoming message notifications. These issues were resolved by whitelisting these apps from the Power Saving Settings menu, but we have a feeling that a non-expert smartphone user wouldn’t be able to figure this out. Another issue we noticed was the overly strict termination of recently used apps. Returning to a recent app would almost always cause it to restart even if it has been only a few minutes since you last used it. On a related note, the honor 7 comes with 3GB of RAM, but we’ve absolutely never seen it use more than 2GB of it. As we mentioned earlier, the fingerprint scanner on the honor 7 is located below the camera, where your index finger can easily reach it. While the fingerprint scanner's primary use is to serve as an alternative to a lock screen PIN, you may also use it to restrict access to certain apps and files. Enabling that feature creates an encrypted folder that can be accessed only after you confirm your identity, be it with a password or a scan of your finger. Neato! Once at your home screen, you may use the scanner to interact with your phone in a number of ways. For example, swiping down on the scanner brings down your notifications panel - a gesture that we actually like and use. And in the camera app, tapping the sensor snaps a shot - useful for selfies. Other gestures, however, are simply impractical. 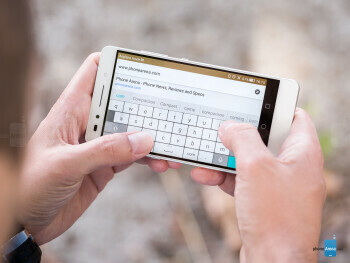 For example, tapping or holding the scanner while in an app may be configured to take you back a step or back to your home screen, respectively. Since you'll be surely touching the scanner by accident, we recommend you to leave these two gestures disabled. Despite having 8 cores under the hood, the honor 7 still gets sluggish from time to time. The honor 7 is equipped with a Kirin 935 SoC, which is a 64-bit, octa-core solution built on a 28nm process. The chip is comprised of eight Cortex-A53 cores - four with a 2.2GHz maximum clock speed, and another four that run at up to 1.5GHz. The GPU in use is the Mali-T628. All of this hardware is backed by 3GB of LPDDR3 RAM. Synthetic benchmarks indicate that the CPU performance of the Kirin 935 SoC is pretty decent. Scores are far from what today’s popular flagship smartphones produce, yet comparable to results from last year’s high-ends. The GPU, on the other hand, struggles with graphically-intensive tasks. If you’re looking for a truly potent gaming device, you might want to look elsewhere. In real life, the honor 7 performs fine, but it does get sluggish at times, so don’t expect it to be flawless in this respect. Occasional slowdowns can be noticed in the UI, especially when switching between apps. As far as gaming goes, basic games run well despite the low GPU scores we highlighted above. Demanding games - with heavy graphics and lots of visual effects - are also playable, but not all run at smooth frame rates. To give a few examples, Dino Hunter and NFS: No Limits run fine, but Asphalt 8 gets a bit choppy. The 16GB of on-board storage, only 10.46GB of which are actually available to the user, do get filled up pretty fast. Using a microSD card with the honor 7 is strongly recommended, although you should bear in mind that doing so makes it impossible to take advantage of the phone’s dual SIM functionality. That’s because the second SIM and the microSD cards go in the same tray and can’t be used together, which is a bummer. The browser gets the job done, although its performance isn’t flawless. The Dual SIM functionality and the IR blaster are nice having. While the large, high-res display on the honor 7 is suitable for comfortable web browsing, the built-in browser leaves something to be desired when it comes to smoothness and performance. Choppiness and lags are observed when heavy web pages are rendered. One is free to use Chrome instead, although its performance on the honor 7 isn’t flawless either. The honor 7 is a dual SIM smartphone, which means you may pop in two SIM cards in there and be connected to two carriers simultaneously and/or have two phone numbers - one for your work and another for your personal needs. However, the second SIM card is placed where the microSD card goes, and the two can’t be used simultaneously, as we already mentioned above. As far as connectivity goes, the honor 7 boasts two cellular antennas and is able to switch dynamically between the two for better reception. We may connect to Wi-Fi 802.11ac/a/b/g/n networks at 2.4GHz or 5Ghz. LTE, Bluetooth 4.1, aGPS and GLONASS positioning are on board as well. The built-in IR blaster lets us control TVs, DVD players, air conditioners, and other appliances. There’s no NFC, however. A truly capable camera is held back by its flawed software. The camera experience can make or break a smartphone, so let's take a good look at what the honor 7 has to stand its ground with. On its back we find a 20MP f/2.0 camera that uses an 1/2.4" sensor with phase-detection autofocus and native 4:3 aspect ratio. A durable, scratch-resistant sapphire cover protects the lens. There's also a dual-tone LED flash. On the front of the handset we find an impressively sounding camera setup - an 8MP snapper is paired with an LED flash, the latter being a rare feature. As for the software running the show, it is the weakest link in what seems like a very potent camera. Long story short, the app is too slow. It is slow to start and it is slow to take a picture. When the shutter is tapped, the frame freezes in the viewfinder, but the actual image is captured a fraction of a second later. We ended up with more than a few blurry photos because we moved the camera without realizing that the photo had not been captured yet. Making matters worse, there's an always-on (as in you can’t turn it off) auto-HDR mode – an HDR photo is taken instead of a regular one whenever the camera decides that it is needed. But there's absolutely no indication of the HDR mode's activity. This wouldn't have been a big deal if the HDR mode was actually fast. It is not - the camera needs at least a couple of seconds per every HDR shot it captures. But the honor 7's camera app does have a few neat tricks up its sleeve. One of them is the Light Painting mode, which works by leaving the shutter "open" for a long time and capturing traces of light, as if they're strokes of a glowing paintbrush. The mode appears to work by taking a series of long exposure shots and overlaying new light information in a compound image. There's also the so-called Super Night mode, which produces really impressive night photos. These two modes can also be used to snap great images of fireworks and lightning strikes. The catch is that both modes, as awesome as they are, require you to use a tripod or to rest the camera against something to keep it steady. While the honor 7's camera software leaves a lot to be desired, the camera itself holds great potential, especially when handled by someone with the right skills. First and foremost, images are taken in great detail, which is no surprise given the high resolution of the sensor. There's a very good balance between noise filtering and detail preservation. White balance has never really been an issue for us. Colors are rather neutral and look okay, although we wouldn't have had anything against a tiny bit of extra color saturation. Dynamics are handled pretty well, with highlights and shadows preserved accurately enough. Even in poor lighting conditions, the honor 7 usually produces satisfactory results, although keeping your hand steady in such situations is very important. The automatic mode works fine in the majority of cases, and if you're feeling confident in your photographic skills, using the aforementioned Super Night mode may yield even better results. The mode gives you some control over the shutter speed (1/4s to 32s) and ISO (100 to 1600), and we'd say that ISO 1600 is definitely usable. 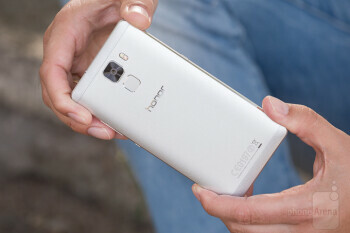 Selfies shot with the 8MP front camera look nice and detailed, which makes them more than share-worthy. The camera’s viewing angle is wide, so more than a few of your buddies can fit in. The front-flash, however, is rather weak. It emits warm white light, but the difference it makes to our selfies is barely noticeable. It is only useful in complete darkness. It is also disappointing to know that it works only inside the stock camera app - you can’t use it during your video chats. By default, the honor 7 shoots 1080p video at 30 frames per second, just like most other modern smartphones do. Footage looks okay - definitely not as detailed as what a Galaxy S6 or the iPhone 6s would produce, but usable nonetheless. 4K and 60fps videos are not supported. 120fps slow-motion videos can be recorded at 720p resolution and look acceptable. What you also get is an HDR video mode, which might have a positive impact on dynamics when used properly, but might make the video look overexposed if the mode is enabled when isn't needed. Use it with caution. Oh, and don't bother with that video Stabilizer mode. Video comes out choppy and just not pleasant to look at. Whether you're enjoying music, watching a video, or flipping through your photos, the honor 7 delivers. The stock gallery on the honor 7 is simple and intuitive to use, with thumbnails arranged in a grid that you can zoom in and out of. It features a wide array of editing tools, allowing you to crop and rotate your image, as well as to add artistic effects to it. A slight adjustment of the saturation, highlights, and shadows sliders can make the difference between a good and a great photo. For those who still listen to their music offline, the stock music player gets the job done. It has a simple UI, it comes with a basic widget, it provides playback controls in the notification panel and in the lock screen, and it lets you search through your library. However, we couldn’t get album art to be displayed, and the absence of an equalizer is puzzling. The only audio enhancement is a DTS effect, which boosts the song’s volume and makes sound audibly fuller. On a related note, an FM radio is also available on the honor 7. Just bear in mind that you have to provide your own set of earphones as a pair doesn’t come in the box. The honor 7’s video player is rather basic and simple. The only “advanced” feature you get are control over the playback speed and the optional DTS sound enhancements we mentioned above. The app does play 1080p videos in various formats just fine. 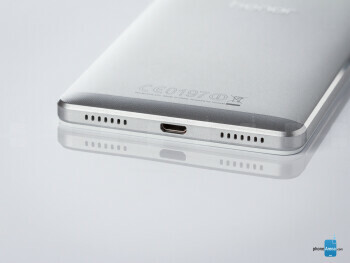 A single loudspeaker placed at the honor 7's bottom is what you get. It is of decent quality, it doesn't crackle even at the maximum setting, and it among the louder speakers we've benchmarked, outputting 77 decibels of sound pressure. But its placement makes it easy to cover by accident while watching video or playing games in landscape. The built-in IR blaster is a neat addition. It allows you to use the honor 7 as a universal remote control. We tested it successfully with a couple of TVs - channels were changed instantly, without lags, and range was not an issue. Nothing to complain about, folks. The honor 7 has a loud earpiece that sound clear and natural even at the loudest volume setting. Same is the case on the other side of the line, although we had this one instance when a strong gust of wind blowing into the microphone rendered our voice unrecognizable. Still, calls sound great almost all of the time, even in noisy environments. For example, we made a couple of calls recently while attending a concert. Not once were we asked to repeat ourselves. The loudspeaker comes in handy for making hands-free phone calls while driving. A solid, reliable performer that will last you through a day of serious usage. There's a 3,100mAh non-removable battery inside the honor 7. According to the manufacturer's specifications, the phone should provide up to 500 minutes of talk time or up to 350 hours of stand-by time per charge. Our custom battery life benchmark returned a result of 8 hours and 2 minutes of on-screen time, which is an excellent result. What's more important, however, is that we've been getting solid battery performance in real life as well. The honor 7 has no troubles lasting through a whole day of normal use. And by normal use, we mean having the screen's brightness set to Auto, leaving all radios, cellular data, and Location Services enabled, and having Facebook, Twitter, Messenger, Viber, and Skype installed and running. In the evening after a typical day, our honor 7 would usually have at least 30% battery left to last us through a night out. The honor 7 has a battery saver mode that might come in handy in dire situations, although we've never really had to use it. Basically, it reduces power consumption by limiting the phone's functionality - you're only allowed to make calls and send text messages. With the mode enabled, we noticed a 1% drop in battery level per 5 hours of stand-by time. By the way, the honor 7 supports fast charging, but only if you buy a beefier charger separately. The one in the box outputs up to 2 amps at 5 volts, which is a typical rating. Also, the phone may act as a power bank in case you happen to have a USB OTG cable. As the old saying goes, you get what you pay for. Yes, the honor 7 has an attractive price given the hardware specs and feature set you get in exchange, but as a whole, the phone is far from perfect. We have no major complaints about the way it looks, the way it is built, or the way it feels when handled. The display’s color inaccuracies are also something we can live with. And we’re very pleased by the phone’s battery life, the quality of its still photos, and the clarity of its phone calls. What’s really hard to ignore, however, is the fact that the software on the honor 7 needs a lot of polishing. Sure, it works, but at this point in time, a phone of this rank should deliver a much smoother user experience. To be more specific, lags and choppiness occur a bit too often, not to mention that switching to a recent app is a pain. And it is really disappointing to see a camera that can take such great photos being held back by its laggy software. On an optimistic note, software is something that can be improved with an update.